This is such a clever piece of comedy and my all-time favourite sketch by the duo. 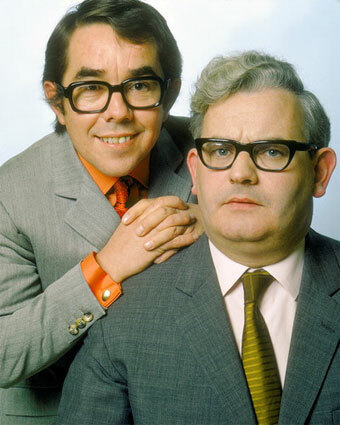 Ronnie Barker plays the role of Magnus Magnusson (he hosted Mastermind at the time, of course) and Ronnie Corbett plays the role of contestant Charlie Smithers whose specialised subject is "answering the question before last". A great idea for a sketch and this had me in tears of laughter when I first saw it. This is one of the most memorable sketches from The Two Ronnies show. In the sketch, Barker walks into an old-fashioned ironmonger's store - there were still plenty of local shops to be found in the 80s - and asks for "four candles." Corbett gives him the candles but it turns out that Barker wanted "fork handles - 'andles for forks". The comedy continues as many more items are misinterpreted by Barker, making this one of the funniest sketches they ever produced. The Two Ronnies Show ran from 1971 until 1987 on BBC1 and was hugely popular. A combination of intelligent comedy writing and well-acted, believable characters helped Ronnie Barker and Ronnie Corbett to become one of the most respected UK comedy double-acts of all time. The first TV appearance of the duo together was in The Frost Report (hosted by David Frost) when they featured in a sketch with John Cleese about class. Ronnie Corbett played the working class guy, Ronnie Barker was middle class and John Cleese was upper class. Of course, this worked brilliantly due to their different heights. Sadly, in 1987 Ronnie Barker quite suddenly announced that he was retiring from show business, preferring a quieter life running an antique's shop in Dean, near Chipping Norton. Ronnie Barker also starred in the hit BBC comedy series Porridge and Open All Hours, whilst Ronnie Corbett starred in another BBC comedy series Sorry, although this wasn't as well-received by the critics as Ronnie Barker's shows. Ronnie Barker did come out of retirement in 2004 to take part in "The Two Ronnies Sketchbook". Sadly, he died of heart failure on 3rd October 2005, aged 76. 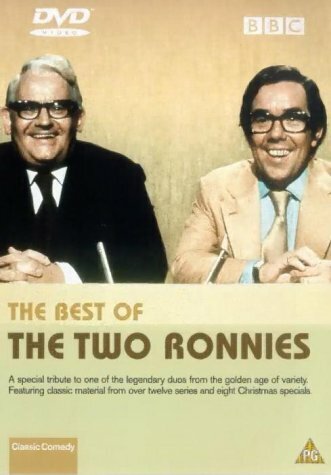 The Two Ronnies show would nearly always feature a funny musical performance towards the end of the show, in which the duo would sing a medley of songs using a different style in each show. The clip above features traditional pub songs, but with totally different lyrics, of course!